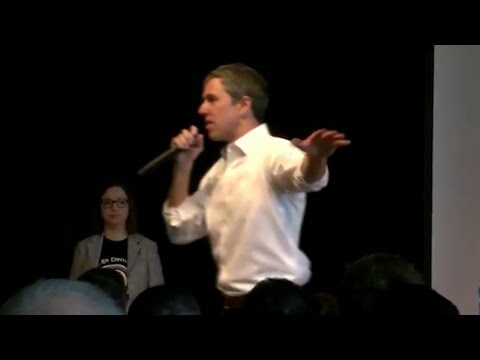 DUBUQUE, Iowa (AP) — At a packed eastern Iowa house party, a staffer for Democrat Beto O’Rourke’s presidential campaign tried to clear enough space for the candidate to reach the kitchen, where he would need to climb a stepladder to address the crowd. That’s a prophetic question for one of the 2020 field’s most unconventional candidates. In a primary that has so far been defined by progressive energy, the former Texas congressman with a scant political resume is trying to avoid definition. He left a distinctly moderate record behind in Congress and, in the early days of his presidential campaign, has vowed to work with Republicans and woo voters who backed Donald Trump in 2016. But he’s also hit progressive talking points on everything from white privilege to marijuana legalization . The architects of his campaign insist he’s not interested in adhering to a particular ideological lane, and O’Rourke himself shuns party labels. But trying to have it both ways could leave Democratic voters with the impression that O’Rourke is a candidate with a split political personality. Backers say O’Rourke can and should toggle between liberal and moderate positions depending on the topic. “If there’s an issue he might be more centrist on, he’s honest about that. He doesn’t try to pander to a certain base,” said Rep. Kathleen Rice, D-N.Y., who endorsed O’Rourke over another, home-state Democrat in the race, Sen. Kristen Gillibrand. That rhetoric sounds a lot like Barack Obama’s pitch to voters in 2008. Solomon, who was a Democratic delegate for Obama that year, said trying to recreate the former president’s brand of pragmatic progressivism isn’t a winning strategy in 2020, when many Democratic voters are motivated by anger toward Trump. That could also be a challenge for Obama’s vice president, Joe Biden, who is nearing a decision on whether to join the campaign as a leading centrist candidate. O’Rourke has deviated from messages of moderation by expressing openness to adding justices to the Supreme Court and tearing down U.S.-Mexico border walls in places like his hometown, El Paso. He’s also equated the criminal justice system to modern day Jim Crow laws because he says it’s so much tougher on people of color. It’s all a far cry from when O’Rourke arrived to Congress in 2012. Though he called for the federal legalization of marijuana long before much of the rest of the country began to turn on the issue, O’Rourke pledged to be pro-business and joined the New Democrat Coalition rather than the Congressional Progressive Caucus. He’d also said he would support raising the Social Security eligibility age and basing eligibility on recipient income. O’Rourke refused to back Nancy Pelosi’s House minority leader bid in 2016, dismissing her and Senate Democratic leader Chuck Schumer of New York while campaigning against Cruz for misunderstanding Texas. But Pelosi had only kind words for O’Rourke last week, calling him a “welcome addition” to the 2020 primary. He also drew criticism from home-state Democrats for failing to endorse Gina Ortiz Jones, who was trying to unseat Republican Rep. Will Hurd in November. Hurd lives outside San Antonio and when a 2017 snowstorm canceled flights to Washington, he and O’Rourke drove from Texas to the nation’s capital, livestreaming for hours and developing a friendship that some celebrate as a rarity in such hyperpartisan times. Rice counters that the party doesn’t have to agree on everything. Associated Press writer Elana Schor in Washington contributed to this report.